Imagine… no more nagging your children to brush their teeth! 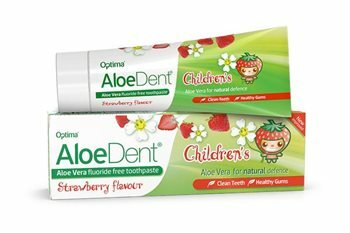 That’s because our AloeDent Children’s Toothpaste comes in a delicious new strawberry flavour just for kids. This fruity little pinky-red toothpaste is fluoride-free and contains only the best quality ingredients which can help provide long-lasting protection against cavities, plaque, tartar and gum disease. Apply a pea-sized amount of toothpaste onto your toothbrush. Brush twice daily with AloeDent Children's toothpaste for healthy teeth and gums. It is recommended that children should be supervised when brushing. a very nice, very reasonable in price strawberry toothpaste that my the children enjoy! Very nice,my daughter loves this toothpaste!! My children is allergic to nuts. Is this product suitable for him? Many thanks. HealthStuff Replies: After checking the ingredients we have found that the product contains Escin (Horse Chestnut). In this instance our advice would be not to use this product.